What does Crescendoh, Frida Kahlo and I have in common? I'm pretty sure than by now almost everybody has hear about Crescendoh, the new online community that is about to "open" on March 1st. Well, I'm been working with Jenny in some projects for the site and I can't be more excited and happy with the results. The other surprise is... (drumroll please).... Rubber stamps! My first set ever! And not just any rubber stamps, they're clear ones, so you can actually see where you're putting it. I'm over the moon for these cuties. 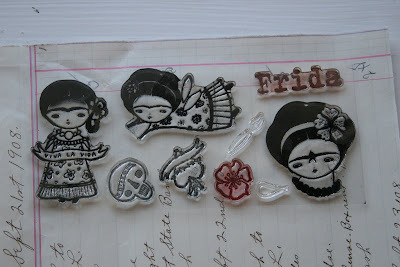 This set includes a flying Frida, Frida with black bird, Viva la Vida Frida, flower, heart, skull, brush and a tear (this one was a must!). I'm already planning all the things that I'll do with them! They'll be available soon but you can see some examples of these stamps made by Jenny Doh here, stay tuned for the release! I just started selling beaded and embroidered Frida dolls on Etsy and was referred to your site by a buyer. 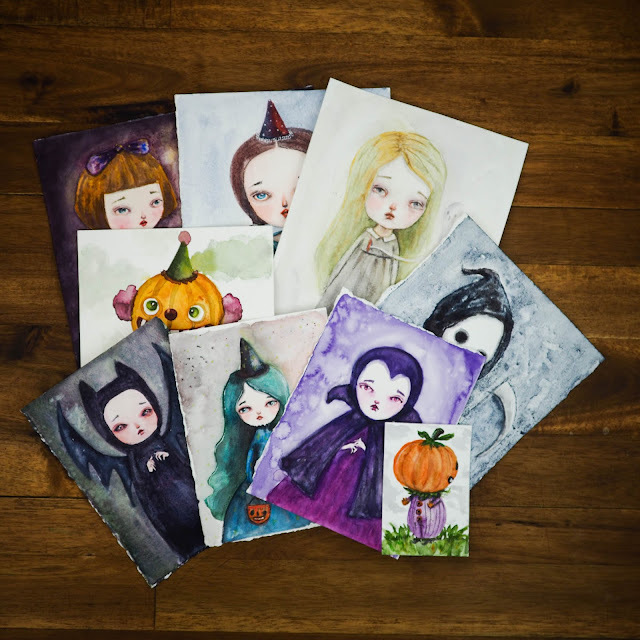 I love your artwork, dolls, stamps, everything! I'm also really awed by your success so far with all the magazine coverage, etc.! Congratulations. If you have a moment and would like to check out my Fridas, my shope is http://snapdragon13.etsy.com. Forgot to say that the bag is really incredible, love the portrait of Frida that you created! I live in Spain, I come from Seville, in the South and I wanna know how can I buy some of your products! I love this bag too! All your things are gorgeous! aha!! I thought you were a bit quiet! No wonder you are onto exciting, new things Congratulations! I hadn't heard of Crescendoh,, I must check it out! Yo estoy deseando recibir mi collar, pero aun faltaran unos 15 dias hasta que llegue el correo. The bag is lovely and the stamps fantastic!!!! CONGRATULATIONS! I know you'll have great success! OMG, I am new to your blog and love every bit of it!!!! when and where can i get these stamps...i NEED to have these...!!! danita, congratulations on the stamps! they look awesome! and i love the frida bag! I absolutely LOVE it!!!! I want one! Can't wait to see more at Crescendoh! just bought the stamps and can't wait to get them!! they would go lovely on tags and bags for my little handmade jewelry shop called "viva la vida" but don't think that's possible due to the copy rights thing... they're still lovely though and im sure i'll have so much fun with them!! !